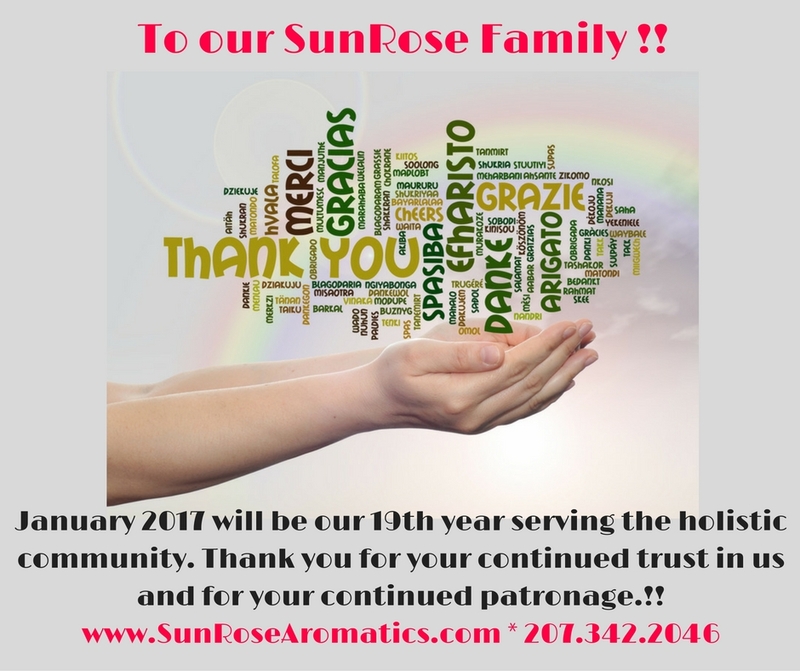 This January marks 19 years of SunRose serving the holistic community. Thank you for your continued patronage and trust in us. So many of you have followed us throughout the years and I want to say from my heart to your hearts .. thank you. When we moved from the Bronx NY to Belmont Maine it was a huge leap of faith, however, I am so grateful we followed our dream and moved here to the farm. We all need a dream .. and as my Mom would tell me .. ‘Once a thought, it will become a deed.’ My wish for you is that you find that dream that resonates in your soul and follow that dream. Yes it is scary .. but a good scary .. it may take a few years (we moved here when I turned 62) so do NOT let your age deter you. Yesterday, January 6th, was Chuck and I first wedding anniversary. We are now living here on the farm 3 years and our gardens are growing. Filled with many holistic and culinary herbs and flowers. And hopefully in the future we will get to distill them. Each season we tackle new projects and so, in the winter months we dream of Spring and all the new plantings we are hoping to accomplish. Hoping 2017 brings new adventures to you all, filled with hope, and love and all good things ..
Oh, and be on the look out .. for on the 19th of each month we will have specials for the day .. to celebrate 19 Years of SunRose Aromatics. ~ til next time ..